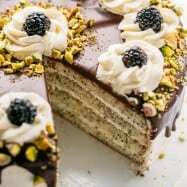 I love this sponge cake recipe. 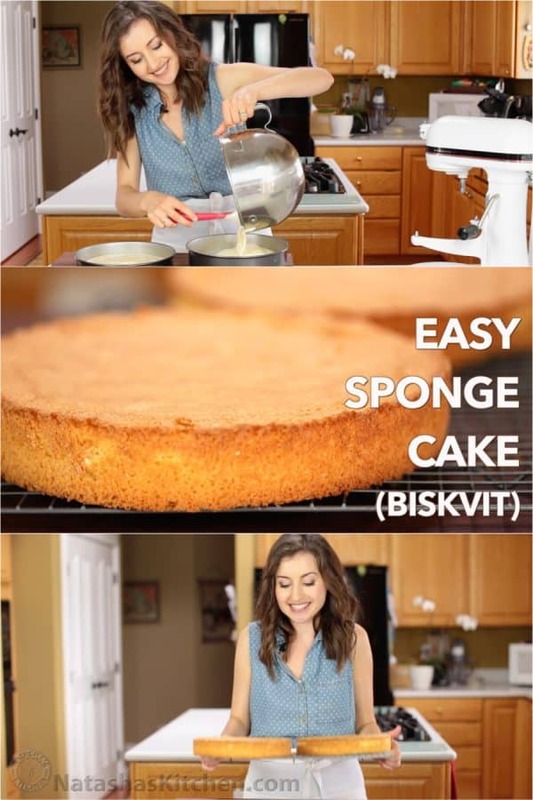 It’s easy and you can make hundreds of different cakes with this base. This is a classic European sponge cake (aka Genoise). Once you have this recipe down (you’ll memorize it after a couple rounds), you’ll be baking things that look and taste like they are from a fancy bakery. This cake base takes on moisture really well from fruit, frostings, liqueurs and syrups. As you can tell from my cake recipes, I’m a sucker for moist cakes. 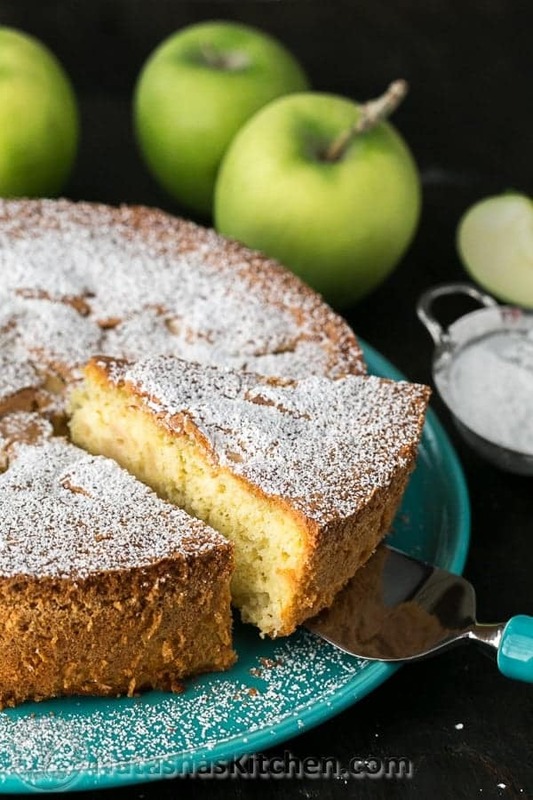 Read on to see 11 marvelous recipes you can make using this sponge cake base. 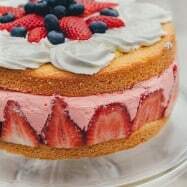 Over the years, I’ve tested countless different ways to make this cake and this is the best, most fail-proof method for genoise that I’ve tested. This is not like American cakes and readers often question if it can really be that easy and only have 4 ingredients. 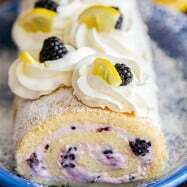 Blackberry Lemon Cake – soft and moist and has a fluffy lemon blackberry buttercream frosting. 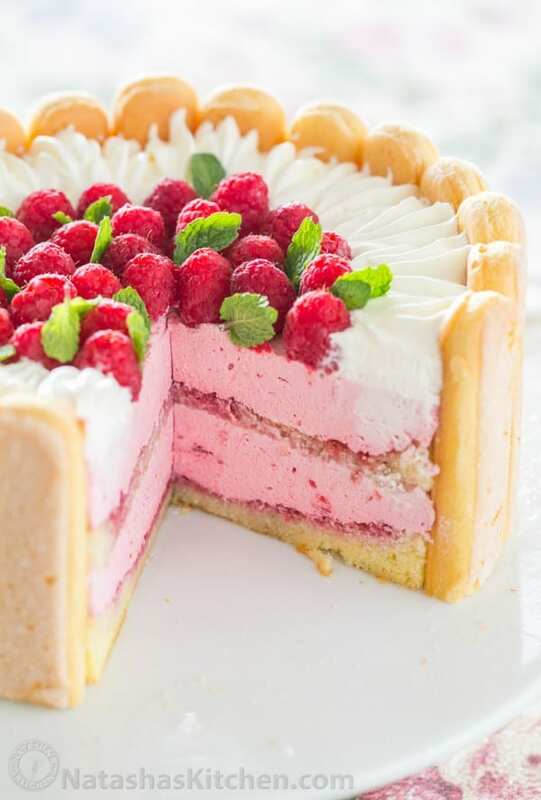 Charlotte Cake – layers of raspberry mousse, lady fingers and fluffy cake. 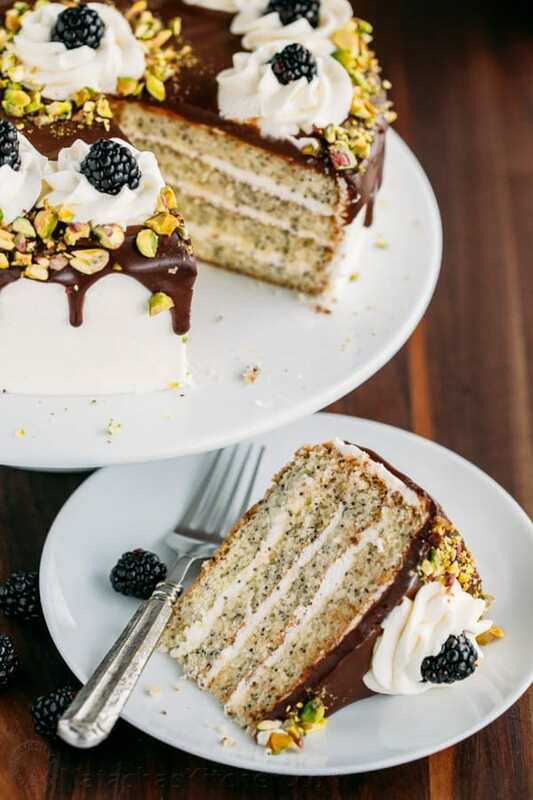 Poppy Seed Cake – fluffy and moist with a hint of rum and it’s not overly sweet. 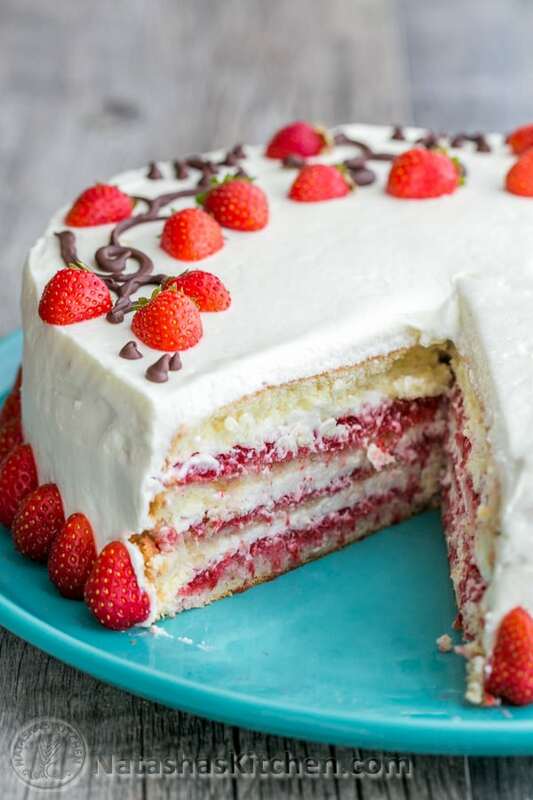 Strawberry Cake – boasts 1 1/2 lbs of fresh strawberries. You’ll love the simple and delicious whipped cream cheese frosting. 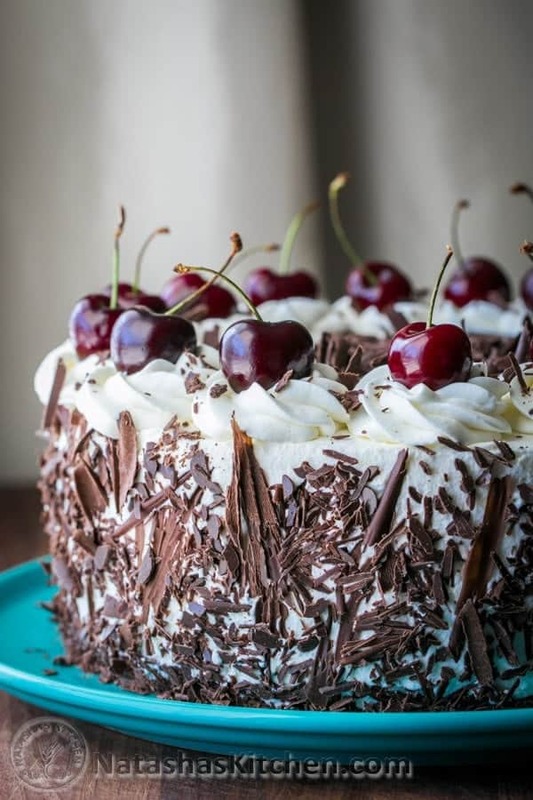 Black Forest Cake – A chocolate version of classic genoise with 1 lb of kirsch infused cherries and whipped cream. So good!! 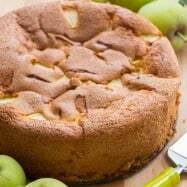 Russian Apple Cake (Sharlotka) – Just 5 ingredients and 15 min of prep then your oven does the rest! 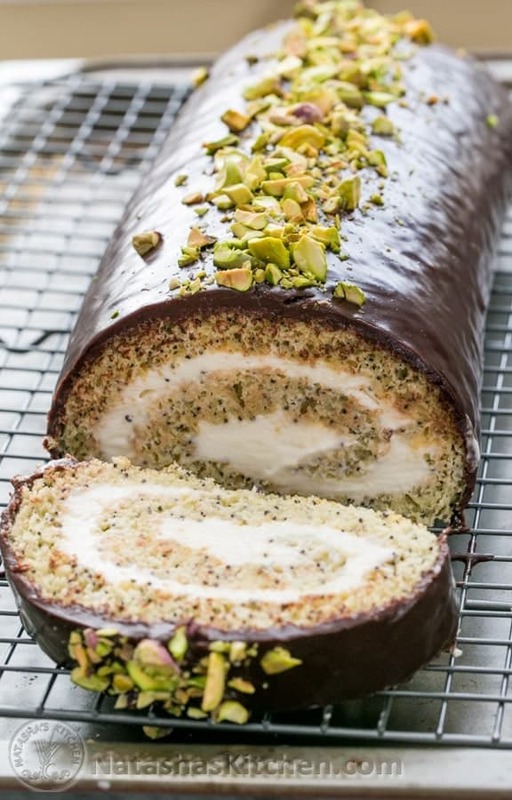 Poppy Seed Cake Roll – Moist, generously filled with a cream cheese frosting, covered with velvety chocolate ganache and pummeled with salted pistachios. 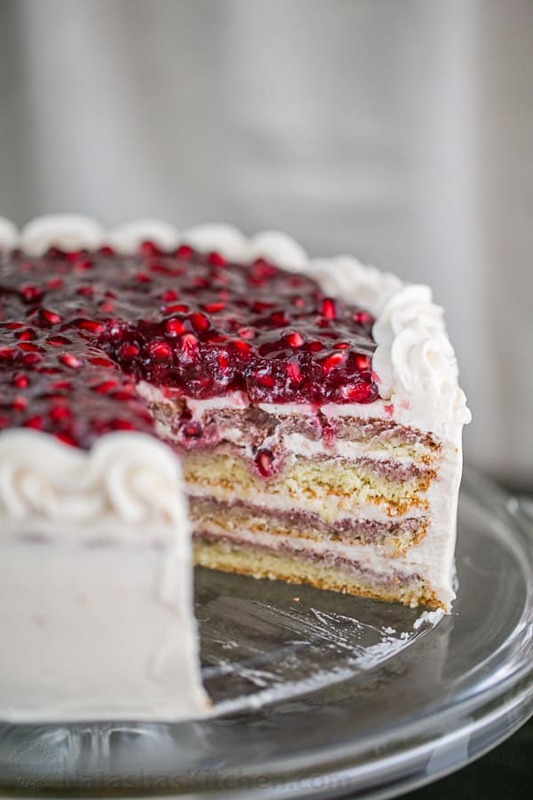 Pomegranate Christmas Cake – With a crown of glistening pom seeds, this one’s a stunner for the holidays. 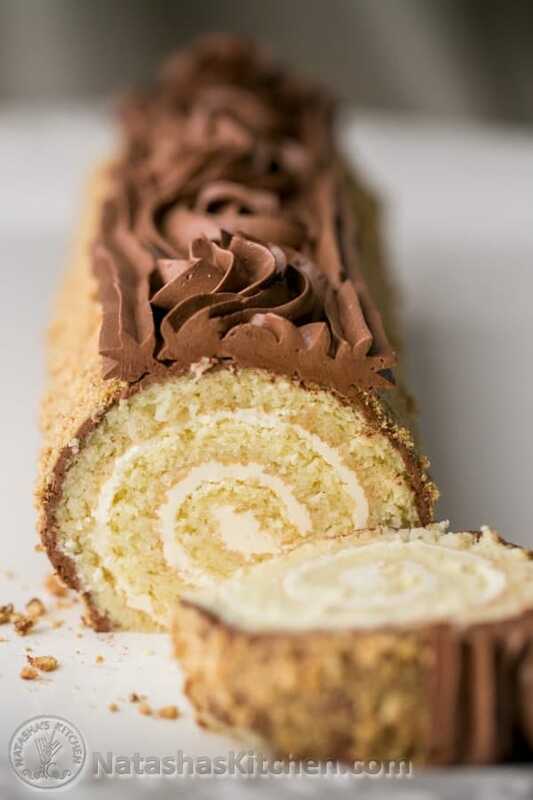 Story Book Cake Roll – This cake roll is moist, rolled with a vanilla butter cream, covered in decadent chocolate and the cookie crumbs give it a subtle crunch. 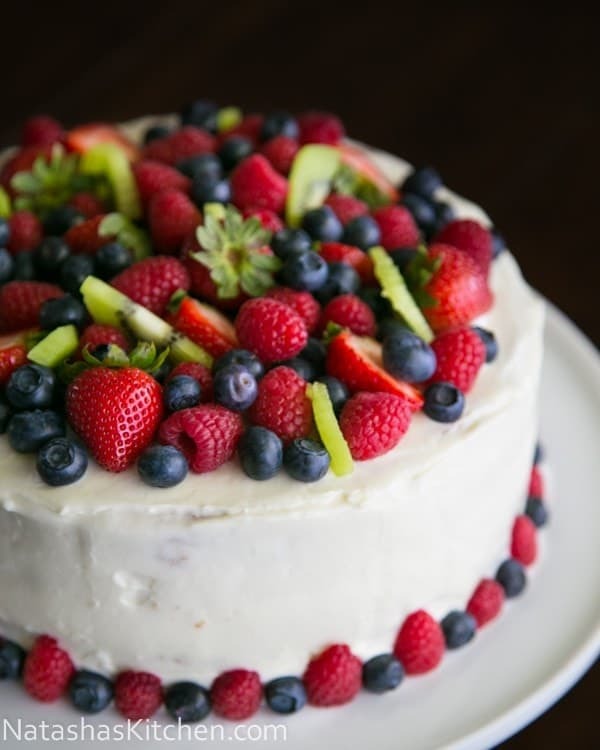 Kiwi Berry Cake – If you love fruit, this cake will make your dreams come true. Layer after layer of gorgeous berries. 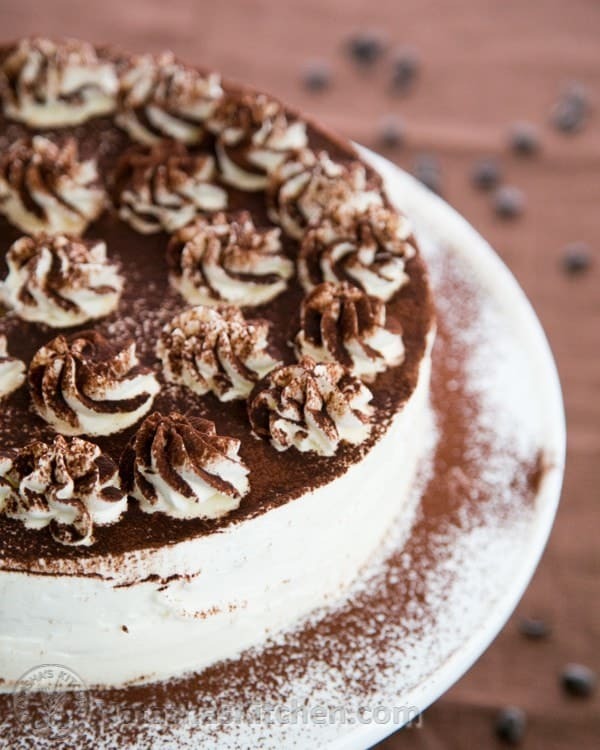 Tiramisu – if you like tiramisu, you will love this! 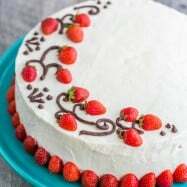 Once you master this easy European sponge cake (genoise), you can make hundreds of different cakes using this base! Preheat Oven to 350˚F. Line bottoms of two 9″ cake pans with parchment paper (do not grease the sides). In the bowl of an electric stand mixer fitted with whisk attachment (this is the one I have), beat 6 large eggs for 1 minute on high speed. With the mixer on, gradually add 1 cup sugar and continue beating 8-10 minutes until thick and fluffy. Whisk together 1 cup flour and 1/2 tsp baking powder then sift this mixture into fluffy egg mixture one third at a time. Fold with a spatula with each addition just until incorporated. Scrape spatula from the bottom to catch any pockets of flour and stop mixing when no streaks of flour remain. Do not over-mix or you will deflate the batter. Divide evenly between prepared cake pans (it helps if you have a kitchen scale to weight the pans). Bake at 350˚F for 23-28 minutes (my oven took 25 min), or until top is golden brown. 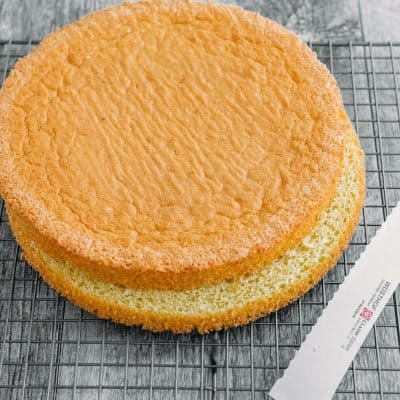 Remove from pan by sliding a thin spatula (here’s the one I love for cakes) around the edges then transfer to a wire rack and remove parchment backing. Cool cakes to room temperature then slice layers equally in half with a serrated knife. Hi Natasha — I haven’t made this yet, but wondering if I could make the entire recipe in a bundt pan? The sponge was amazing !!! So moist and tender. I halved a recipe because I only needed “crust” for a no bake cheesecake. Hi Natasha. Thanks for another great recipe! Tried this and it turned out great! I will try these cakes. They ate so easy to make with not too much ingredients. First one I will try is the apple. Will let you know it turned out. 1. Can we make more layers of this sponge cake? For example: To make 5 inch + tall cakes? 2. Will it hold some fondant decorations? I don’t want it collapsing on me. I have made a genoise before for a Fraiser but never thought it could be used for so many cakes! 3. In your mango cake, you just used the pulp in the layers, why not add in the batter? What difference does it make to add puree/pulps into the batter? 4. I am going to upload a video of (your and my version) of a Mango Cake, how do I let you know once its uploaded? 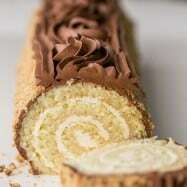 Last, you really torture me with your recipes, I DON’T WAN’T TO STOP WATCHING !_! Natasha, you are a lifesaver. I came across a faded stained, well used recipe in my mom’s hand, in Italian. Beat 6 eggs, 1 cup sugar, 1 t vanilla, add 1 cup + 2 T flour and 1 t BP. Low oven for 45 minutes. A question: reading the comments I noted that many find the batter doesn’t rise enough, so you typically suggest more beating in a stand mixer. So I wonder if your stand mixer motor is more powerful than most? I find I do need to beat the batter 10-12 minutes for that “magic 8” trick (suggested in the recipe) to show me it’s ready. Once it took 15 so maybe the humidity affected things that time. I made it twice with Kitchen Aid 5 speed electric mixer – both times it didn’t work. I whipped it for 20 minutes each time. The batter looked very fluffy. However, it still became some smushy paste after I baked it. We are really impressed with your sponge cake receipe, we tried it today and it came out beautiful and shiny and it is absolutely delicious. Thank you for replying and that is what I thought. I will use the cake p pans. J’ai un four qui fait la chaleur tournante. Comment faire un bon réglage ? Can i add sugared vanilla to the batter or cognac? I will be making forêt blanche tomorrow but baked the sponge cake tonight. Thanks for your suggestion. It worked perfectly, it was a big and delicious cake..
Hi Natasha, so glad I landed on this recipe! But I am having some trouble, I tried making this twice and both times came out dense and not fluffy. Hopefully I could get some advice! What I noticed was my mixture of eggs and sugar was not white and fluffy after beating. I tried beating for about 4 mins for the eggs and another 13 mins after adding sugar. I didnt continue to beat afterwards because I was afraid of overbeating. Also I do not own a standing hand mixer. I am using a a simple hand mixer. I will try again by adding some time to the beating for the eggs + sugar mixture. I am using a electric hand mixer. I didn’t open the oven door until it was done baking. Hopefully this time it will be better, Thank you! I used your recipe to make my first ever sponge cake and I have to say this come out great! Although I have nothing to compare, I think I will not let it bake as long next time I think it may have been a little dry? I also added some pumpkin spice in the batter which was okay but not great, lesson learned. For the frosting I whipped egg whites and added hot maple syrup and further whipped. I tried this today and it smells too eggy for me. What should I add? 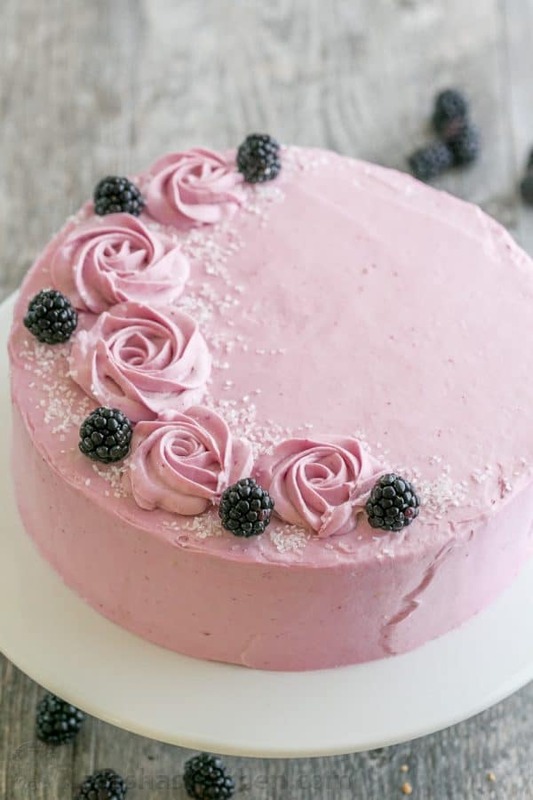 Hi, this cake looks amazing, I was thinking of trying out sponge cake for the foundation of a whipped cream & strawberry cake I was thinking of making; However, I assume that you would need to flatten the rounded tops of the cakes before layering them together with a long bread knife, right? Thanks!